The innovative Advantage 400, a new member of the Advantage family of full face and half masks, convinces through exceptional comfort and sophisticated design. An important characteristic of the Advantage 400 is user-friendliness. The innovative patent-pending single loop head harness grants the user an intuitional operation and offers high comfort and flexibility. The unique one-piece over-molded silicone nose cup is soft and pleasant to wear and extremely robust. Single & Twin Port - The Advantage 400 is available with single thread [Advantage 410] and bayonet twin [Advantage 420] connection. For both versions MSA offers a wide range of different filters, suitable for all applications. Easy Donning - The Advantage 400 sets standards never seen before in the area of ease of use. The user can quickly adjust the mask according to his individual requirements. 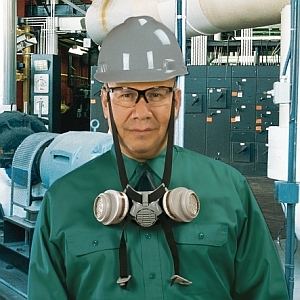 Safety - The patent pending single loop harness and onepiece silicone nose cup provide maximum safety. Cost Effectiveness - Due to the well-engineered design, cleaning and maintenance efforts are significantly reduced.